Inequities regarding technology access in our schools can cause students from different socioeconomic backgrounds to fail to develop information capital, which leads to a shift in power. This concept has come to be known as a digital divide, and it is a problem that schools take a close look at. Today, school districts are seeking effective ways to increase access to digital tools and resources to disadvantaged populations in an effort to close the achievement gap that the digital divide has the potential to create. Former Superintendent Darryl Adams of the Coachella Valley Unified School District in California had a unique strategy to combat the digital divide. Coachella is located in the Sonoran Desert, just 50 miles north of the Mexican border, where nearly 90 percent of students qualify for free and reduced lunch and few families have access to the Internet in their homes. More than half of the children are not fluent in English. About 2,000 students are the children of migrant farm workers who labor on date groves, citrus trees and grapevines that flourish on irrigated land. This article from 2014 reports on Adams’ efforts to introduce technology resources in the community. The school district invested money to become a one-to-one school district. Every student received a device from their school and teachers were trained in how to incorporate them as valuable teaching and learning tools. To solve the access-at-home issue, Adams implemented a unique strategy that has now been duplicated in schools across the country. He outfitted his school buses with Wi-Fi capabilities, then he started parking buses at night in neighborhoods so that children and their families could make use of the free Wi-Fi from the bus. Although there were logistics to iron out, Adams’ idea was brilliant as it focused on equitable access to technology tools, thus eliminating a barrier to equity that his teachers face each day when working with students in the classroom. Adams’ prior approach is in line with research that suggests that the digital divide can be overcome. In a 2016 research study in Israel, Gila Cohen Zilka concluded that when a school provides students with technology in the home, it increases the acquisition of skills and study habits and the realization of individual potential. Zilka wrote, "children spoke about self improvement as a result of exposure to the digital environment, about a sense of empowerment and of improvement in their advantage in the social fabric. Many children expressed a desire to continue their education and expand their knowledge of computer applications, the use of software, of games, and more." In my own New Hampshire community, we attempted to attack the digital divide by implementing a one-to-one technology system in 2016. We purchased and distributed devices to each and every student in our system and invested resources to help train staff on various blended learning instructional techniques so that the technology tools would become a powerful learning tool for all children. In conjunction with that, the district took advantage of Internet Essentials, a program by Comcast NBCUniversal to provide affordable Internet options in the home. In this Huffington Post article, Senior Vice President of Community Investment for Comcast NBCUniversal and President of the Comcast and NBCUniversal Foundation Dalila Wilson-Scott reported on the success of the Comcast NBCUniversal program, which in its first five years enrolled 750,000 low-income households, benefiting 3 million Americans. Seventy-five percent of program users are people of color. Nearly 2,200 employees volunteer their time to act as ambassadors in their community to explain the program to those who could benefit from it. Wilson-Scott states, "Knowledge is power for families and communities, especially in this digital age. That’s why we are committed to using the reach of our technology, storytelling and media platforms to affect people in meaningful ways and change their lives for the better." 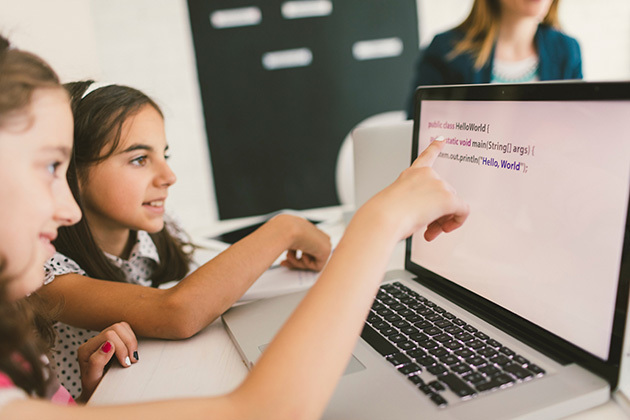 With programs such as this on the rise, the ball is back in the court of school leaders to find better ways to help students use technology to close the digital divide, once and for all.